How long does a mechanic’s lien last? A mechanic’s lien is valid for a period of one year from recording. 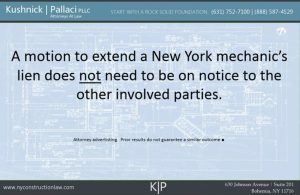 How do I extend a mechanic’s lien on a single family dwelling? To extend a mechanic’s lien on a single family dwelling you must obtain a court order. While the law is not crystal clear on the subject, there is case law that says as long as the motion to extend is filed before extension then the lien extension request is timely. A lien on real property improved or to be improved with a single family dwelling may only be extended by an order of a court of record, or a judge or justice thereof. No lien shall be continued by court order for more than one year from the granting thereof, but a new order and entry may be made in each of two successive years. How do I extend any other private improvement mechanic’s lien? Such extension shall contain the names of the lienor and the owner of the real property against whose interest therein such lien is claimed, a brief description of the real property affected by such lien, the amount of such lien, and the date of filing the notice of lien. No lien shall be continued by such extension for more than one year from the filing thereof. Do I have to extend a mechanic’s lien if I have started a foreclosure action? No lien specified in this article shall be a lien for a longer period than one year after the notice of lien has been filed, unless within that time an action is commenced to foreclose the lien, and a notice of the pendency of such action, whether in a court of record or in a court not of record, is filed with the county clerk of the county in which the notice of lien is filed, containing the names of the parties to the action, the object of the action, a brief description of the real property affected thereby, and the time of filing the notice of lien. What if another lienor has filed a foreclosure action and named me as a party? If a lienor is made a party defendant in an action to enforce another lien, and the plaintiff or such defendant has filed a notice of the pendency of the action within the time prescribed in this section, the lien of such defendant is thereby continued. Such action shall be deemed an action to enforce the lien of such defendant lienor. How do I extend a public improvement lien? If the lien is for labor done or materials furnished for a public improvement, it shall not continue for a longer period than one year from the time of filing the notice of such lien, unless an action is commenced to foreclose such lien within that time, and a notice of the pendency of such action is filed with the comptroller of the state or the financial officer of the public corporation with whom the notice of such lien was filed; or unless an extension to such lien is filed with the comptroller of the state or the financial officer of the public corporation with whom the notice of such lien was filed within one year from the filing of the original notice of lien, continuing such lien and such lien shall be redocketed as of the date of filing such extension. 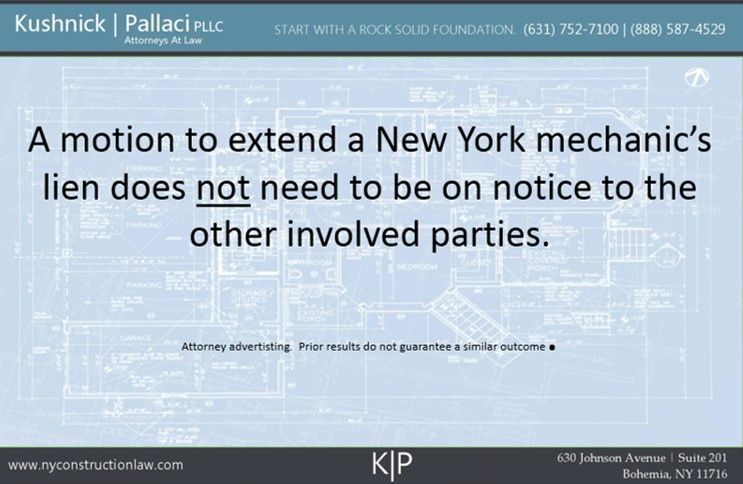 The attorneys at Kushnick Pallaci regularly prepare and file mechanic’s liens, including lien extensions and lien foreclosure actions. Contact Jeffrey Lhuillier to learn more. This entry was posted in Mechanic's Liens and tagged Extensions, Lien Extension, Mechanic's Lien by VTP. Bookmark the permalink.